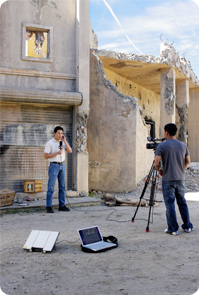 OCENS offers the most versatile satellite equipment and service for live broadcasting in remote locations and mobile internet and voice connectivity with coverage anywhere in the world. An Inmarsat BGAN terminal can provide dedicated IP streams via satellite with speeds of up to 384 kbps for live video broadcasts as well as 64kbps ISDN for live audio streaming. The background IP connection provides speeds of up to 492kbps and a voice calling channel that can be used simultaneously. A built in WiFi hotspot makes it easy to connect and allows multiple users. Iridium provides the only handheld satellite phone that will work anywhere on the earth’s surface. The phones are compact, durable, and easy to use, and the high-capacity battery provides up to 30 hours of standby time. The new 9575 model also has integrated automated GPS tracking and an SOS button. Stay in contact no matter where you are with an Iridium satellite phone.